Guess who was able to run outside yesterday morning?! I didn’t have my Lulu neck warmer but it was fine; the temperature in the morning was above freezing and the first snow flakes of the day didn’t start until I was almost done with my run. I may not love February weather but I do LOVE the things I am about to share with you today! 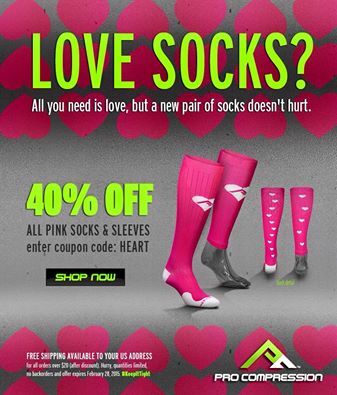 Have you seen February’s Pro Compression sock of the month yet? Pink with hearts?! Yes! We need these for sure. So cute all.year.long. Use coupon code HEART at checkout for 40% off all pink socks and sleeves. Code expires February 28, 2015. Lots of frozen yogurt stores are honoring the holiday so be sure to check to see if your local shop is offering a discount or something special. In my quest to find out if Red Mango had a deal for today, I came across the coolest thing ever. 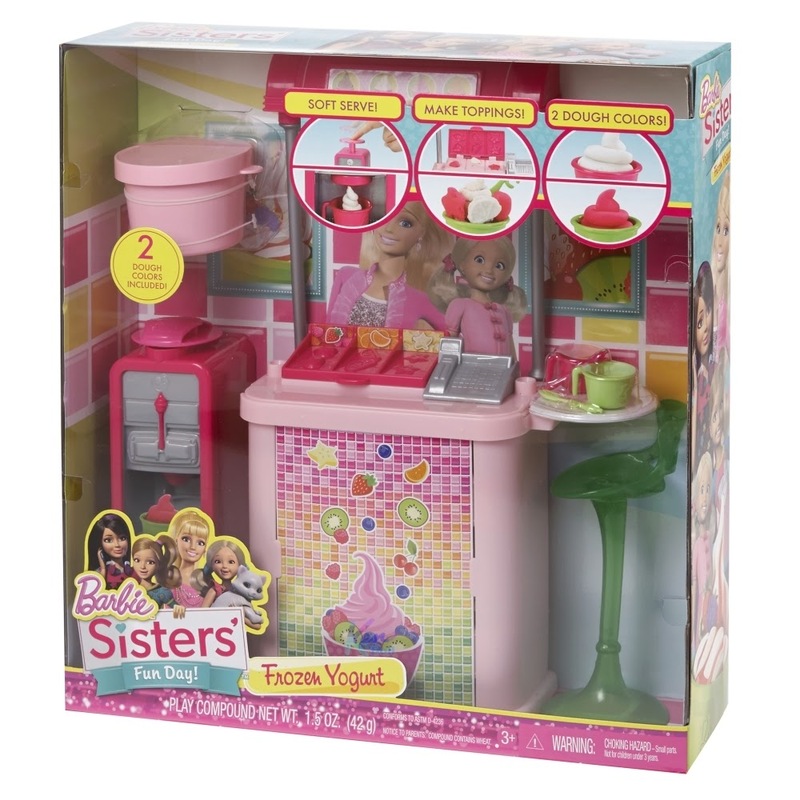 Did you know that Barbie had a Frozen Yogurt shop? I would have loved to play with this. I would still love to play with this. And how about the FIRST EVER limited edition LOVE product in honor of LOVE month! We are talking super special heart-shaped chocolate and strawberry LOVE O’s cereal in a really pretty box. 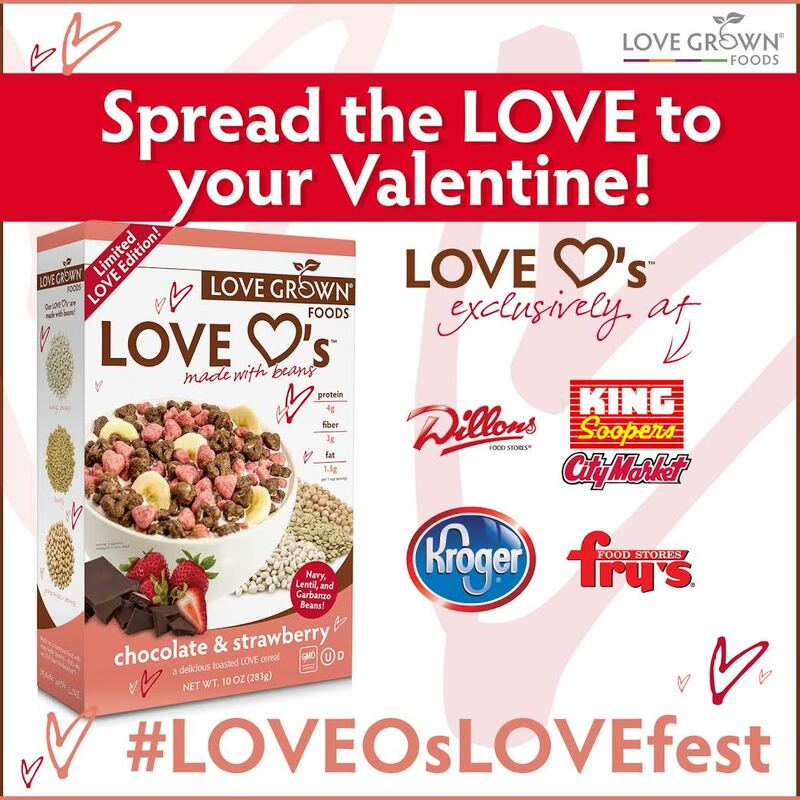 This limited LOVE edition cereal is available at Kroger, Soopers/City Market, Dillons and Fry’s for the next few weeks only. 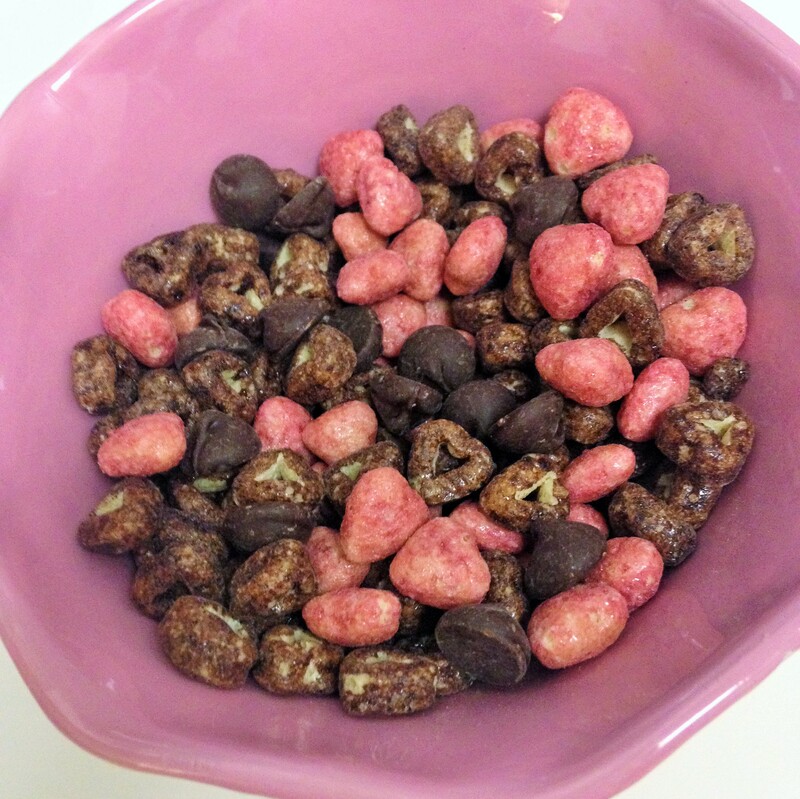 I received my Valentine’s Day LOVE Drop the other day and have been enjoying the heart LOVE O’s as an evening snack with dark chocolate chips which is a total step up from the cereal-fail I experienced earlier this week. You know LOVE O’s are made with beans right? I still can’t believe it. You would never know! All Love Grown Foods products are free of genetically modified ingredients, high fructose corn syrup and hydrogenated oils. 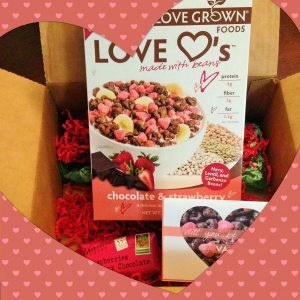 Want the chance to receive your own Limited Edition Valentine’s Day LOVE Drop of LOVE O’s Cereal? 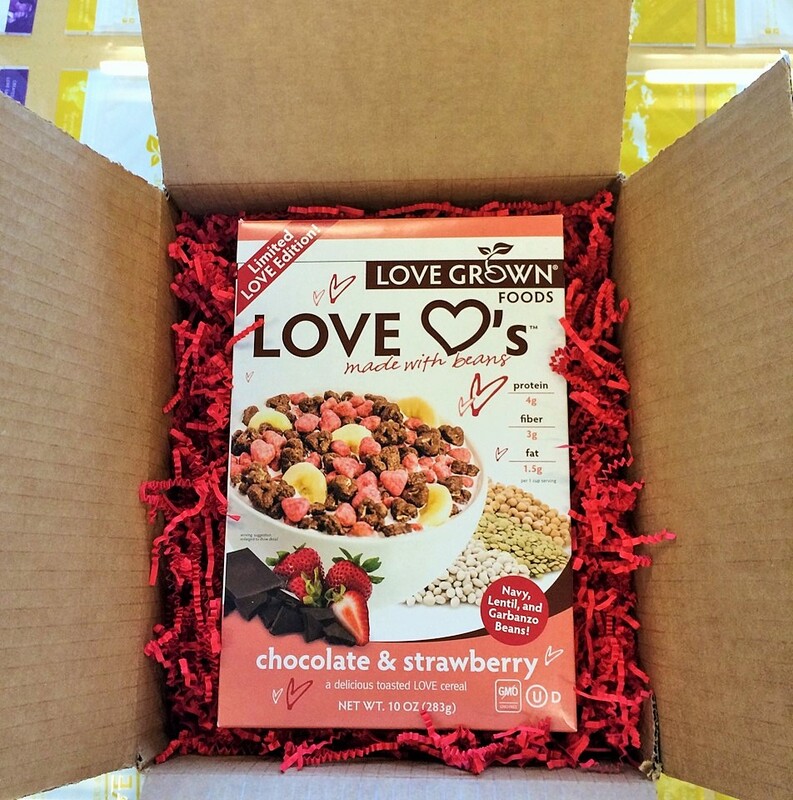 To enter the LOVE Drop giveaway, leave a comment on this post telling me your favorite cereal from when you were a kid. One winner will be selected and announced on Monday! Open only to United States residents. I received the Limited Edition LOVE O’s LOVE Drop as part of my Love Grown Foods Ambassadorship. I was not compensated to write this post and all opinions are my own. Favorite cereal as a kid? Do you prefer cereal with or without milk? Are you going to get frozen yogurt today? Is it really national fro-yo day?!!? I may have to honor that….or see if my local store does….but by the looks of the guy who runs it….I doubt it, he seems a bit shady haha! I would LOVVVVEEE to win, but do I really have to pick a favorite cereal??? Uhhhh okay, crunchy nut is my favorite cereal from home, I really need to buy some more over here! Thanks for the reminder! This is my type of holiday!! My favorite cereal when I was younger is a toss up between – lucky charms, cinnamon toast crunch, and captain crunch. Oh and fruit loops! Geez I haven’t had those in forever. Happy Friday! P.S. Yay for running outside! 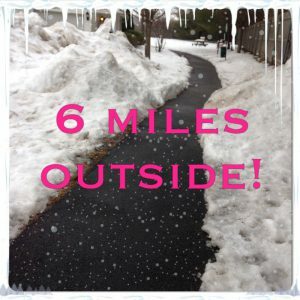 Sara @ Lake Shore Runner recently posted…Friday Five Favorites: I’m on Groupon!! I liked Peanut Butter Captain Crunch. I think I saw a new Captain Crunch out in Target the other day but I forget what kind it was. Happy that you could finally run outdoors again, still cold her in PA but have been hitting the roads. My favorite cereal, Coco Puffs, yes loves me some chocolate!!!!!!! And cue the choirs of the gods–National Froyo day. ER. MI. GERD. Long run fuel anyone? Team Cheerios. My favorite of all time. I still hate that they were taken away from me. I liked the Multigrain Cheerios – those were real good. I always liked my cereal a bit mushy but only a drop of milk. Not too much. I guess liking mushy cereal goes along with liking oatmeal lol. As a kid we always had many different boxes of cereal, my two favs were fruity pebbles and cookie crisp. Man just thinking of those leaves a waxy film feeling in my mouth….I can’t even remember the last time I had cereal for breakfast. I don’t know how I functioned eating Cocoa Pebbles for breakfast. I loved Cookie Crisp too! And Fruity Pebbles. And Waffle Crisp. And Life. I really loved Life. I always loved cocoa puffs! I loved Cocoa Puffs too but ate Cocoa Pebbles more often. Oh wow, I can’t believe you ran outside! Good for you! I’ll definitely be getting frozen yogurt ha ha. Enjoy your weekend! Amanda @ .running with spoons. recently posted…. 14 healthier chocolate desserts that will make you weak in the knees . Lucky Charms have always been my favorite cereal! I’m hoping to be able to find some group today to celebrate! I liked chocolate lucky charms! Lucky Charms have always been my favorite cereal! I’m hoping to be able to find some froyo today to celebrate! I used to love Oat Bran as a kid and thought I was choosing a tasty, yet healthy, cereal…ignorance is bliss as a child! I remember liking Cracklin Oat Bran. I’m definitely going to have to celebrate national fro-yo day! Favorite cereal as a kid was Captain Crunch! My parents never let me have junk cereals so OF COURSE I craved them. I loved any kind that turned the milk sugary/chocolatey with cocoa krispies and cinnamon toast crunch coming in on top. The milk from Cocoa Pebbles was the best! I’m Canadian, but it’s Cinnamon Toast Crunch, all the way baby! With milk. I’m so glad you got to run outside!!! YAHOO! I am hoping to run outside tomorrow too but I am not sure yet – ugh. My favorite cereal when I was little was probably a tossup between Corn Pops and Froot Loops. But my mom only let me ever have them on vacations! Now I’m very thankful for that, haha! I’m definitely a cereal with milk kind of person, and I think almond milk is especially delicious on cereal! Off to find some froyo! Haha, right?! The cereals we wanted to eat as kids – now we understand why our parents would limit it! I would have eaten bowl after bowl of Cocoa Pebbles for breakfast. I loved Reese’s Puffs! The chocolate and peanut butter milk at the end was amazing! Totally agree with you, the milk at the end was so so good! Oh gosh Meredith. Come to Utah and run with me. I went trail running yesterday and it felt like a perfect spring morning–no snow, sunny, happy, and I was sweating!!! Like…becuase the weather was so nice haha. I didn’t realize I missed weather sweat. Josh and I are totally addicted to frozen yogurt. We’re going today. Have the best weekend ever!! Kirtley Freckleton @ The Gist of Fit recently posted…The Dangers of Giving up Meat – Part Two: Carnivore? Herbivore? Omnivore? Scavenger. I can’t get over the beautiful weather you guys are having out there! I see it on the news and I am so jealous. Hopefully by March things warm up here! I want to win that cereal so bad!! My favorite cereal as a child was peanut butter Captain Crunch! I really liked the peanut butter captn crunch too! 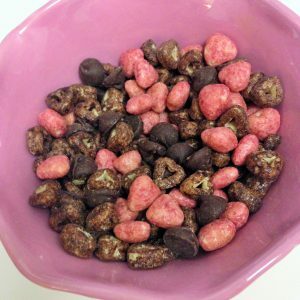 I loved Cocoa puffs because of the texture and of course the chocolate taste! I am lactose intolerant but always enjoy my cereal with almond milk instead or even top it on my protein shakes. Plus its always a handy snack to pack along as well by itself! Sometimes my stomach can handle fro-yo and I did just get a buy one get one free for our local shop…might just have to go by today! My favorite cereal when I was a kid was Cocoa Krispies! I used to wait with my mom in the mornings before school. I would love to try this new cereal. That company is incredible! Honey Nut Cheerios was just the best! rice krispies with extra sugar! Once when my mom went away, my dad took us to the grocery store (& being totally clueless to the fact that my mom severely limited out sugar intake) allowed us to pick out a cereal. To this day, I still remember the Ninja Turtle Ninja Nets cereal as the best I have ever had!! I am sure it was gone by the time my mom returned home! 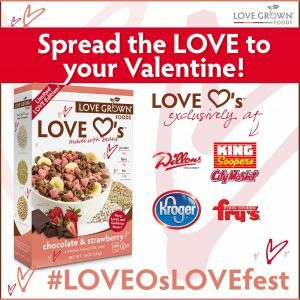 The new LoveGrown Power O’s have definitely stolen my heart! As a kid I ate probably the sugariest (is that a word?) cereal I could. I loved Captain Crunch, Cocoa Pebbles, Fruity Pebbles, and Frosted Flakes. Yep. And I want to play with the Barbie frozen yogurt shop too…sad, but true. When I was a kid I LOVED when my mom would buy us those small boxes of cereal (which was more of a treat, she wouldn’t always buy them) that had a sample of everything and since I’m a “save the best for last” girl I always saved Corn Pops box for last!! Andrea recently posted…WIAW: The Best English Muffins Ever! My childhood fave? Frosted flakes! I liked Frosted Flakes as a kid. I grew up in Ukraine and there was no cereal, but I got Kix in packages from US from my uncle and we were so excited to eat them! My favorite cereal as a kid was probably Honey Nut Shredded Wheat. Always with milk. I haven’t had it in years! That’s awesome you got to run outside today. We actually had 48 degree weather today and I wanted to run so bad. It wasn’t meant to be though. Next time for sure. My favorite cereal growing up was a toss up between Lucky Charms and Frosted Flakes. Basically anyway to get sugar. Those were special occasions though. I loved french toast crunch! My favorites were Golden Grams and Honey Combs!